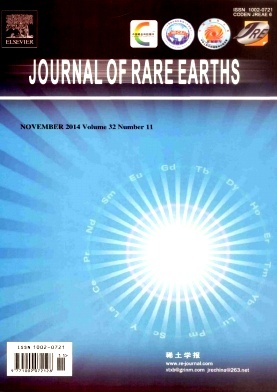 The Journal of Rare Earths has been indexed/abstracted in Sci Search, Research Alert, Chemistry Citation Index, Engineering Index, Metadex Collection, Current Bibliography on Science and Technology and Inspec etc. By submitting a manuscript, the authors agree that the copyright for their article is transferred to the publisher if and when the article is accepted for publication. It is the author's responsibility to obtain written permission to reproduce material which has or will appear in another publication. Wayman C M, Duerig T W.Engineering Aspects of Shape Memory Alloys. Edited by Durieg T W, Melton K N, Stockel D. Beijing: Industry Publisher, 1990. 3. Brouwer R, Dewit C T. A simulation model of plant growth with special attention to root growth and its consequences. In: Whittington W J, ed. Root Growth. London: Butterworth, 1969. 224.